Our emergency department is staffed 24/7 with emergency specialists, offering high-quality, humanistic care in a modern, spacious facility that is equipped to handle any emergency for adults or children. We are known for our patient safety and medical excellence, particularly for heart attack and stroke. Our accommodations and amenities ensure privacy, comfort, convenience, and a positive experience for patients and their loved ones during an emergency. Our accredited Emergency Medical Services (EMS) team operates the largest hospital-based ambulance system in Bergen County, providing diagnostic tests and immediate care to patients on route to the hospital. 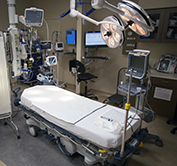 Our Emergency Care Center is equipped to handle any emergency. Among our areas of expertise are stroke care, cardiac care, and sepsis management. Dialing 911 is the single most important thing you can do if you are a loved one is having a suspected stroke, triggering a chain reaction among our experts, from first responders to the interventional team. As a Joint Commission-designated Primary Stroke Center, Englewood Hospital has been recognized for significantly improving outcomes for stroke patients. Our success relies on a thoroughly coordinated response to this time sensitive emergency. Our stroke team comprises first responders within our Mobile Intensive Care Unit (MICU), doctors, nurses, and technicians. When our MICU team reaches you, our emergency department is contacted, which in turn sets off an alert to our stroke team. When you arrive, our team does an immediate assessment and CT scan, which is located in the center’s in-house imaging suite. The brain scan is reviewed by a neurologist, who will then decide the appropriate treatment based on results. After you are treated and stabilized, you will be admitted to our stroke unit, where rehabilitation will begin shortly thereafter. Physical, speech, and occupational therapists will work together to help you through the recovery process and in planning the transition home or to a rehab facility. Our EMS team has received the American Heart Association’s Mission Lifeline Gold Award (2016) for improving treatment of a severe heart attack called a STEMI, which is caused by a blockage of blood flow to the heart. 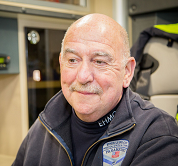 The team has protocols in place that improve response times, from the moment the 911 call comes in to the moment you receive treatment at the hospital. First responders run diagnostic tests while you’re in transit to the hospital, sending that information to Emergency Care Center staff who then alert the interventional team of your pending arrival. When needed, you will be taken directly to the cardiac catheterization lab, where that team is on standby 24/7, ready to perform an emergency procedure to open the heart blockage. Both the EMS team and Emergency Care Center staff are trained in identifying symptoms of sepsis, which is a potentially life-threatening complication stemming from an infection. Protocols are in place to expedite care and provide IV fluids and antibiotics. 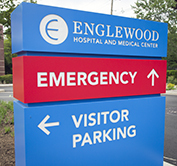 Englewood Hospital and Medical Center offers easy accessibility to our Emergency Care Center where our team of specialists are on-hand to meet your medical and treatment needs. We offer free valet parking. A booth is located directly outside the main entrance of the Emergency Care Center. If you prefer to park your vehicle, signs will direct you to the designated parking lot, which is located directly in front of the building. A greeter and triage nurse are stationed in the main lobby of the waiting room and will ask you brief questions upon your arrival, including what prompted your visit and details about your medical history. The nurse will take and record your vital signs and take you to the dedicated fast track area or main treatment area. It’s important to know which medications you take, why you take them, how often you take them, dosages, and any allergies you have. If you cannot provide a complete list, we will connect with your physician for that information, so that we can accurately diagnose you and plan your care. Once the initial assessment is complete, you will be brought to one of two places depending on the nature of your condition, both designed with your safety, comfort, and privacy in mind. For less urgent cases, you will be brought to our sub-waiting area and then evaluated and treated in our dedicated fast track area. For urgent cases that require immediate attention, you can expect to be brought directly to a patient room. A patient access representative will be on hand to register you, which will require a driver’s license or identification card and your insurance card. If you do not have your insurance card, that information can be collected at a later date. If you are uninsured, you will later have the opportunity to work out a payment plan or learn about charity care programs. Based on the initial assessment, our team will order the appropriate tests or studies. Wait times will vary, depending upon the type of exam or labs. Results from blood work can take up to two hours to process. The Emergency Care Center is equipped with its own imaging suite to expedite care to patients requiring a CT scan or other radiology-related services. A radiologist will read your exam, which usually happens within an hour of the test. We understand that waiting for results can be frustrating and in some cases, cause anxiety. Please know that we will always do our best to take care of you in a timely fashion and that you are welcome to ring the call bell to speak with a nurse for status updates while you wait. Once a diagnosis has been determined, you will either be discharged or admitted. If you are discharged, a physician or nurse will go over all relevant information with you. You will also you will receive a phone call from one of our experts in the coming days, following your visit. If you are admitted, we will contact your primary care physician to coordinate your care. If you do not have a primary care physician, one of our hospitalists will supervise your care. Hospitalists are board-certified physicians in internal medicine, family practice, and other specialties who specialize in caring for patients while they are in the hospital. If you do not have a primary care doctor, your hospitalist will refer you to one following your discharge. If you need help with your transition back home, care coordination services and other resources are available to you to ensure you have everything you need in place to successfully return to your daily activities outside of the hospital. Copies of your results and/or medical records can be made available to your physician by filling out a request form at his/her office, which we will send as soon as the request is received. If you choose to pick up a copy, please visit the Health Information Management department to fill out the required paperwork. Learn more about requesting medical records. 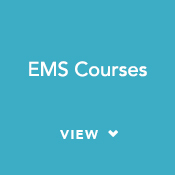 Our highly skilled paramedics and emergency medical technicians are prepared to respond to any emergency, from basic transport and patient care procedures to specialty response techniques such as hazardous material and natural disaster management. Our team serves as a key point of contact between the hospital and neighboring municipalities, including Englewood, Englewood Cliffs, Leonia, and Palisades Park. We are an American Heart Association community training center and offer many training courses, including cardiopulmonary resuscitation, advanced cardiac life support, pediatric advanced life support, international trauma life support (ITLS), instructor and continuing education courses for EMTs and paramedics, and classes for non-healthcare professionals, such as CPR. Learn more about our training programs or register. If you are experiencing a medical emergency, call 911 right away. Note about physician bills: If you have questions about physician billing, please contact Emergency Physicians of Englewood, PC, at 800-666-2455. 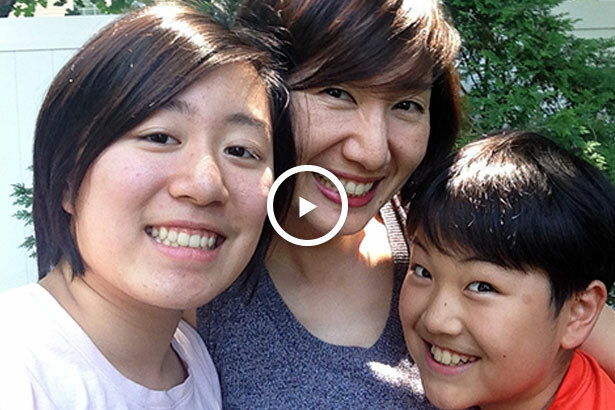 Sunmin received life-saving emergency surgery at Englewood Hospital and Medical Center for a burst appendix.